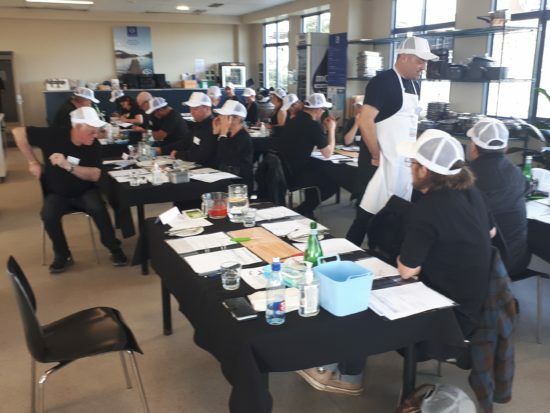 This week I spent two days in Auckland judging at the Devro Great New Zealand Sausage Competition. It was taste buds, the olfactory sense and mandibles to the fore as eight tables of judges worked their way through nearly 500 sausages in fourteen different categories. Each table had a butcher and two foodie judges. The butcher judged the technical aspects of the sausage, while the foodie judges had to assess the appearance and taste of each sausage. The discussion at the table on the merits of each sausage was robust and enlightening. Our table judged beef and a new category this year, innovation. In the innovation category there were a wide range of entries. These sausages included fat free, vegetarian, vegan, allergy free, preservative free and more. 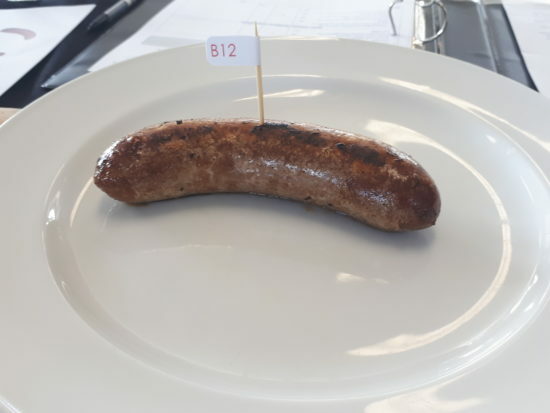 The judging is completed blind, the title of the sausage is displayed on the marking sheet, and any maker’s notes, however all branding, labels and identifying marks are removed prior to cooking and judging. In two weeks the winners will be announced. Having spent two days sampling some great sausages I look forward to seeing which sausages will be announced as medal winners, and of course the coveted supreme award. I will report the much anticipated outcome in a two weeks.